We all made some cygnes, these were mine. This week we moved away from breads and into pastries. It's quite fun. I'm super tired because between classes and last night's Special Town Meeting I haven't really had much time for sleep! Yesterday started out with the T being super delayed. Five of the seven of us were stuck at various points along the Red Line for a half an hour or more. The only saving grace is that the chef was stuck, too, so we weren't really late. And then we had our first quiz. 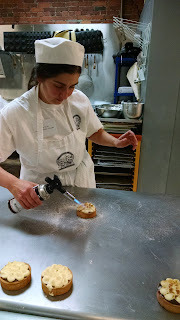 Once that all was taken care of, we started on pâte à choux. This is the flour-water-butter-egg paste that is used to make cream puffs and eclairs. And boy, did we make a lot of cream puffs and eclairs! It took us all day, but we made all sorts of shapes, fondant for dipping, and 6 different flavors of cream filling: coffee, chocolate, rum, kirsch, grand marnier, and praline. 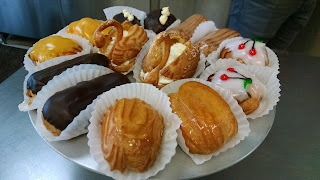 An assortment of cream puffs and eclairs. Let's just say that clean up took a very, very long time. We used a crazy amount of bowls and mixers. And piping tips. This morning was not plagued with commuting woes, which was nice. Today was "Classic Doughs" which meant pie and tart crusts. We learned the difference between pâte brisée, pâte foncer, and pâte sucrée. (Sugar. The main difference is sugar. There are other differences, but that's the biggest.) 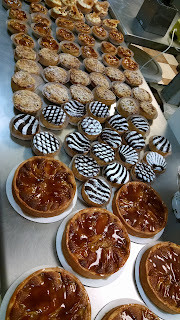 We made five different kinds of tarts. The large tarts, one per person, were Tart Beausejour - caramelized apples with calvados. These and the pear chiboust tarts used the pâte sucrée and all the others, the chocolate tarts, the "Duo" tarts (peach and cherry), and the apricot-brown butter Tart Catalane, used the pâte foncer. 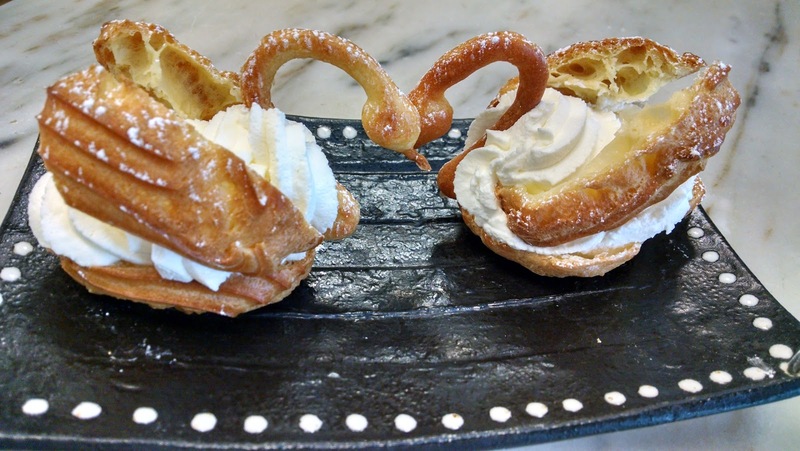 A chiboust is a pastry cream (we made ours with pear purée) with meringue mixed in. That led to the most fun part of my day - using the torch to brulée the chiboust. I LOVED it. I think I ended up doing most of them because I was having so much fun. Oh, and, yes. That's my uniform. Someday I'll get my jacket but for now, that's it. Sorry you can't see the checkered pants. If cleanup from yesterday was long, today was much, much worse. It was all hands on deck to get that all done. So many dishes!